A first aid kit is basically a collection of supplies and equipment that is used to apply medical treatment when necessary. First aid kits are an essential piece of equipment when going hiking or camping. A small injury can easily turn into a very big problem without the proper application of first aid. The idea of a portable first aid kit such as the, First Aid Kit – Emergency Survival Bag for Hiking, Camping- 105 Pieces, is that you have everything that might need in a package that is small enough to carry as part of your gear. This portable first aid kit by survival hax is a small lightweight kit measuring 5 x 2 x 7 inches and weighing in at just 0.55 pounds. Small and portable, it was designed to be able to fit in your hiking or camping gear, in your car’s glove box, in your backpack, or wherever else you might want to keep it for quick access to basic first aid supplies. 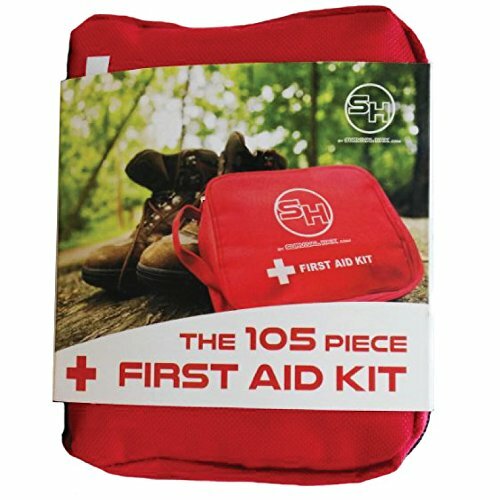 This is a 105 piece kit that also contains a fire starter and a thermal blanket. 1 triangular bandage for making slings for arm or shoulder injuries. 1 large P.B.T ( elastic ) bandage for use on larger wounds. 1 small P.B.T ( elastic ) bandage for use on smaller wounds. 1 roll of non-woven tape for securing bandages or wound dressings. 2 non-woven swabs for wound dressing or cleaning. 10 alcohol wipes for disinfecting wounds. 20 regular sized band aids for basic cuts and scrapes. 10 small sized band aids for basic cuts and scrapes. 4 butterfly band aids for fingertip wounds ( can also be used for knuckle wounds ). 4 H style band aids for knuckle wounds. 4 sting free cleaning wipes. 1 small pair of scissors. 10 safety pins for securing bandages or clothes. 1 CPR mask for non contact mouth to mouth. 1 pair of PVC disposable gloves. 1 pair of plastic tweezers. 1 flint and steel fire starter for lighting fires. 1 first aid thermal blanket to reduce heat loss and combat/prevent hypothermia. 1 first aid bag to pack it all in. First aid bag opens out flat for ease of access. Two zippered inner mesh pockets to hold all the items securely. Corner strap for carrying or attaching purposes. The case is constructed from high wear materials. A good durable case means that you do not have to worry about it getting damaged or breaking and losing all of your first aid equipment. It’s small size means that it can be placed anywhere that you might need it, without taking up a lot of space. Place it in your car, medicine cabinet, in your backpack as part of your hiking or camping equipment. Keep it wherever you might need it in case of an emergency. The carry strap is also useful addition that allows this kit to be carried around easily or even attached to a backpack to have it close and accessible when you need it. The two zippered inner mesh pocket that hold all the contents are a great feature, allowing you to keep your pack organised and keep anything from falling out when you open the pack. You can easily find what you need without having to go through everything. This prevents you from having to remove everything to get to one particular item, saving time in an emergency situation. Elastic bandage are designed to stretch as necessary. Once secured, the bandage will not constrict blood flow and will allow freedom of movement by stretching to accommodate. No need to worry about whether bandages are too tight or not tight enough. They are also breathable, which helps to prevent excess sweating of the area. Non woven tape is low allergenic tape used for securing bandages and wound dressings. It is non irritating, preventing allergic reactions and other typical skin irritations. It peels of easily, preventing discomfort when removing dressings. The tape is breathable, which prevents the skin from sweating and making the tape wet and non adhesive. Non woven swabs are very absorbent and are the chosen type of wound dressing as they do not leave behind any pieces of material in the wound. This helps to prevent any further cause of infection. Especially useful if you do not have immediate access to medical facilities. A CPR mask is an excellent piece of equipment to have in a first aid kit, allowing you to safely deliver CPR without having to worry about infections. It’s a simple item that can make the difference between someone living or dying. The PVC gloves mean that you do not have to handle the materials to clean wounds with dirty hands. They also serve as a form of protection when treating a bloody wound of someone you do not know and, therefore, prevent contraction of any infections or diseases. The thermal blanket is definitely a good addition to any first aid kit. The reflective surfaces stop excess heat loss from the body and help to prevent hypothermia. Extremely useful in emergency situations. The fire starter is excellent for those outdoor survival situations. Fire is useful in many different ways in a survival situation, so it is an extremely useful piece of equipment. The flint and steel fire starter works in all conditions and even works when it gets wet. A whistle. If you find yourself in an emergency situation, such as being in an isolated area with a broken leg, a whistle can help you to get the attention of anyone that might be around and get you the help that you need. A whistle can be heard over longer distances than your voice can carry, which means it could be the difference between being found or not. Burn gels should be a part of any outdoor first aid kit. Campfires and cooking fires make burns one of the most common injuries when camping or hiking. Burn gels are the best way to treat burns in an outdoor environment and prevent them from becoming a more serious wound. Basic first aid instructional leaflets show the user of the first aid kit how to carry out basic first aid in an emergency situation. Not having one can negatively affect the usefulness of the kit. Sometimes applying first aid wrong can be worse than not applying first aid at all. In that case an instructional leaflet really should be a part of any first aid kit, especially for camping or hiking where you may be far from medical assistance. All in all, the 105 piece emergency survival bag’s small size makes it very useful. It’s ability to be carried or stored in places where it is at hand whenever it may be needed makes it a very handy piece of kit. It’s well organised layout makes finding equipment easy and it’s spacious interior allows for the addition of extra equipment. When it comes to the equipment, this kit has everything you need for your basic everyday first aid needs. Keep it in your car, work bag or medicine cabinet for those everyday cuts and scrapes. As a survival bag, however, it seems to be stuck half way between a basic first aid kit and a survival first aid kit, lacking a few essential pieces of equipment that would have to be added for it to completely fulfill it’s intended purpose. The lack of an instructional leaflet would have to be the biggest downfall of this pack. The many useful pieces of equipment that it contains are rendered effectively useless if the user does not have the basic first aid knowledge required to use them correctly and effectively. LIGHTWEIGHT Our First-Aid Kit weighs less than a pound. Take it anywhere! COMPACT This Survival Kit is perfect for traveling - at 5 x 7 x 2 inches it will fit in any glove box or bug out bag. RELIABLE The First Aid Kit you should have in your car, hiking pack, and camping RV. 100% satisfaction guarantee. MYLAR BLANKET Can be used in cool weather and warm weather for hypothermia or cold nights. FIRE STARTER The magnesium flint can be used to make a fire even if it's wet.